On Tuesday 19 April, Chinese President Xi Jinping announced the new Chinese Internet Strategy. The guidelines of President Xi, who is also the Head of China’s Central Internet Security and Informatization Leading Group, constitute a building block of the ambitious objectives set in the five years plan for the development of the Chinese ICT sector, adopted earlier this year. The political guidelines of the Chinese President come just after the adoption by the EU Parliament of key legislation for the development of the EU internet sector, showing a shared objective with the EU’s Digital Single Market strategy: adopting a robust regulatory framework to guarantee cyber security and data privacy to foster the penetration of internet usage. President Xi detailed the political guidelines in a very important speech at the Beijing symposium on cyberspace security and informatization in Beijing. Internet experts, entrepreneurs and officials attended the symposium, including Wu Manqing, Chief Engineer of China Electronics Technology Group Corporation (CETC); Jack Ma, Chairman of Internet commerce company Alibaba; Tong Liqiang, Director of the Beijing Municipal Cyberspace Information Office and Lu Wei, China’s Minister of Cyberspace Affairs Administration. Internet penetration and access has grown in an exponential scale in China over the last years. Today, China has already 700 million Internet users, which is seen as a tremendous achievement by Xi, who adds that the Internet has the potential to be a driving force for economic growth. The President also stressed that this growth should be driven by the principles of innovation, coordination, greener development, opening up to the rest of the world and, last but not least, social inclusion. More human, material and financial resources will be invested in research and development of core and strategically important technologies. Xi especially called on scientists, entrepreneurs, scholars and technicians in the industry to work together toward the goal. In parallel, he encouraged Chinese Internet players to innovate in core technologies, to participate in International competition and to expand their businesses to overseas markets. Xi urged all Chinese authorities to create a favorable environment for the development of these enterprises. “We also welcome foreign Internet enterprises coming to China,” Xi added “as long as they abide by Chinese laws and regulations”, stressing that all talents are welcome to contribute to China’s competitiveness and that a system of meritocracy should be established. “New technology” he said “contributes to the development of civilization and we will never obstruct technologies as long as they help improve productivity and the people’s standards of living,” Xi further called for an in-depth integration of the Internet and the real economy, in order to unleash the full potential of Internet to stimulate innovation and economic restructuring, as well as to drive the shift in the economic development mode. Supply sides measures are however of no use, if the Chinese citizens do not understand their interest in making use of the huge opportunities offered by the Internet. Xi therefore stressed not only the importance of the availability of general public accessible, affordable and quality services, but also of accelerating the popularization of information services. Xi did not avoid the contentious issue of the Internet content. He reminded the potential of the Internet to influence and reflect public opinion, and invited Chinese officials to seize this opportunity provided by the Internet as a tool to better serve people’s concerns, to correct public misconceptions and, in turn, collect constructive criticisms to inform future policies. In order to foster a positive, righteous and healthy cyber environment, Xi advocated a reform of China’s cyber space management to ensure high quality online content carrying positive energy and mainstream values, to everyone’s benefit. 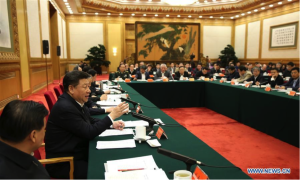 Senior leaders Li Keqiang and Liu Yunshan, who are both Deputy Heads of the Central Internet Security and Informatization Leading Group, also attended this symposium. Xi acknowledged that cyber security is a prerequisite to increase Internet usage. Xi urged to accelerate the process of developing a system which protects key information infrastructure and ensures online security. Besides, Xi pointed out that Internet defense capabilities should be enhanced, and it is the common responsibility of the whole society to achieve a secure online environment: of government, enterprises, social organizations and netizens. The government will, he said, speed up legislation on the Internet and enhance supervision over cyberspace to avert cyber threats. Toward a new Internet Policy? ChinaEU believes that political guidelines given by President Xi at this symposium constitute a turning point in China’s Internet policy. China has opted for a more secure, but also more tolerant and open cyber space. Contrary to the EU, which set up more than 10 years ago a dedicated agency, ENISA, to promote and coordinate national cybersecurity policies, China has not yet developed a comprehensive cyber security strategy. From now on, cyber security will be a focal point of Xi Jinping’s administration. The new policy builds on recent steps. Following the establishment in 2014 of the Central Cyber Security and Informatization Leading Group, the Cyber Security Association of China – a non-profit organization for cyber security – was founded on 25th March of this year, grouping 257 major Internet firms, cyber security enterprises, scientific research institutions and individuals as funding members. The Association will play a guiding role in cyber security governance as well as being a platform for international exchanges and cooperation. Given the close relationship between ChinaEU and the Chinese ICT industry, ChinaEU can be the natural interlocutor in Europe, and for this reason ChinaEU is available to become a key European partner of China’s Cyber Security Association. Comparative studies of the Chinese and EU regulatory frameworks, e-commerce, big data, Internet of things, including the rules on cybersecurity, will also be part of the scope of the China-EU Digital Research Center, which will be launched later this year by ChinaEU in partnership with China Internet Development Foundation. The other novel policy direction put forward in President Xi’s speech is a greater openness to the global Internet system and its players. This new policy will be in particular hailed by those Western Internet companies that complained about restrictions on the access to the Chinese Internet market. In particular, ChinaEU sees great opportunities for EU startups, which can bring innovations to China and complement the role of the incumbent players in the development of the Internet. ChinaEU is therefore exploring the interest in both China and the EU to hold a joint boot-camp program to boost high-tech and Internet entrepreneurship, named SilkCamp. This program will scout European startups to navigate in the Chinese market and vice-versa support Chinese startups to scale up in Europe. 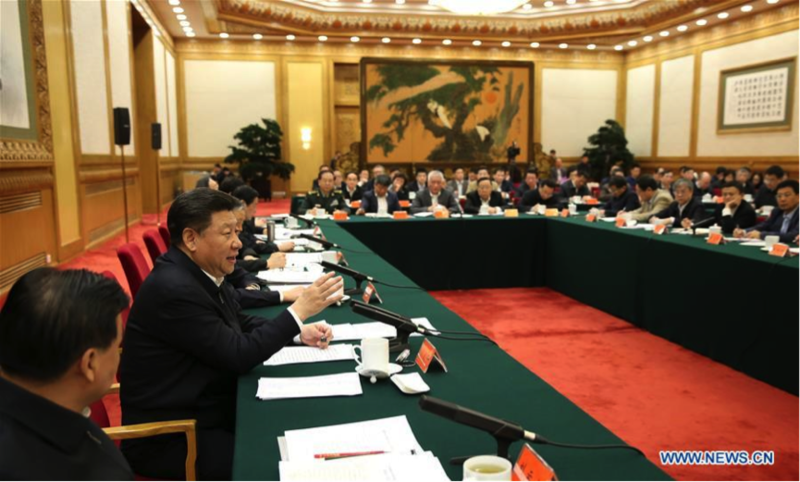 An extensive coverage by Xinhua News Agency of the symposium chaired by President Xi on 19th April can be found here.